Yes – we’re off to GDC in San Francisco this March! We’ll have a stand on the expo floor in the South Hall as part of the Wales pavilion – if you’d like to meet up, let us know! It’ll be great to be back – the GDC Narrative Summit events are always wonderful to take part in, very much the highlight of the conference. During the Independent Games Summit at GDC, Ian will be taking part in the panel Embracing the Co-op Studio Model in Indie Games, where he and others will explain how and why their companies became cooperatives, and what the benefits of that model are in today’s game industry. 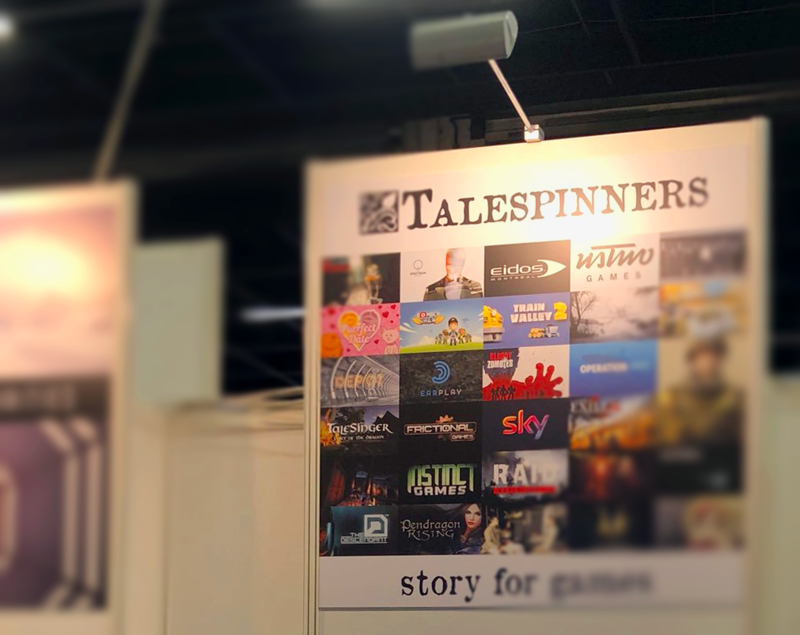 When you develop a game, you need a great writing team, and that is where Talespinners are indispensable. They are able to take your ideas and create whole worlds with them. From the initial idea all the way to final delivery, I wouldn't trust any other wordsmiths. Decisively creative. Insightfully articulate. Committed to the craft. For example, Ian’s recent advice decisively reshaped our critical opening narrative moments to make them deeply affecting... [Talespinners] are consistently responsible, reliable, and efficient. Talespinners quickly grasped our concept and were immediately able to work it into a captivating and inspirational story. Whenever an issue with the narrative came up, Talespinners were always quick to respond and promptly came up with solutions. Talespinners have been wonderful to work with; enthusiastic, imaginative, and organised. I thoroughly enjoyed our story meetings. They’ve delivered excellent dialogue and plenty of strong ideas that have lifted our narrative, and spotted story problems early that might have resulted in wasted work. Even if you have a good handle on your story, I would recommend bouncing your ideas off Talespinners – they’ll come back even better. Ian doesn’t just do the job you give him. He brings new ideas, new approaches and directions, and pulls, sculpts and batters your ideas until they look far shinier than they ever were - or would have been – without him. He is an excellent writer, coder, and logical mind that will help you and your project in far more ways than what is written on any contract or agreement. We had a rough and sprawling story and lore for The Exiled that organically developed over years of development. Ian came and turned that chaos into a structured and coherent document, in the course solving the many logical problems and inconsistencies that had developed. With tiny amounts oversight and feedback from our side he came up with an interesting lore and turned that lore into engaging words. Will work with him again on future projects. It was a pleasure working with Ian on The Bunker, he has an expert eye for game design detail and an incredible talent for bringing real humanity to storylines. His logic in game narrative structure is flawless and he brought an amazing attention to detail to The Bunker, providing layer after layer of storytelling, making the game richer and more immersive. Being just a two-person studio, working with Talespinners has been invaluable to us. From brief to delivery they're professional, friendly and punctual. It's reassuring to know that we can rely on them to create high-quality writing that adds an extra dimension to our game, allowing us to focus on the art and code. What we achieved in a day really impressed us! Talespinners helped us to clarify and amplify our own ideas, bringing them into a clearer structure...We see the workshop and the document that summarises the results as a big success.